See-through solar materials that can be applied to windows represent a massive source of untapped energy and could harvest as much power as bigger, bulkier rooftop solar units, scientists report today in Nature Energy. Led by engineering researchers at Michigan State University, the authors argue that widespread use of such highly transparent solar applications, together with the rooftop units, could nearly meet U.S. electricity demand and drastically reduce the use of fossil fuels. "Highly transparent solar cells represent the wave of the future for new solar applications," said Richard Lunt, the Johansen Crosby Endowed Associate Professor of Chemical Engineering and Materials Science at MSU. "We analyzed their potential and show that by harvesting only invisible light, these devices can provide a similar electricity-generation potential as rooftop solar while providing additional functionality to enhance the efficiency of buildings, automobiles and mobile electronics." Lunt and colleagues at MSU pioneered the development of a transparent luminescent solar concentrator that when placed on a window creates solar energy without disrupting the view. The thin, plastic-like material can be used on buildings, car windows, cell phones or other devices with a clear surface. The solar-harvesting system uses organic molecules developed by Lunt and his team to absorb invisible wavelengths of sunlight. The researchers can "tune" these materials to pick up just the ultraviolet and the near-infrared wavelengths that then convert this energy into electricity. Moving global energy consumption away from fossil fuels will require such innovative and cost-effective renewable energy technologies. Only about 1.5 percent of electricity demand in the United States and globally is produced by solar power. But in terms of overall electricity potential, the authors note that there is an estimated 5 billion to 7 billion square meters of glass surface in the United States. 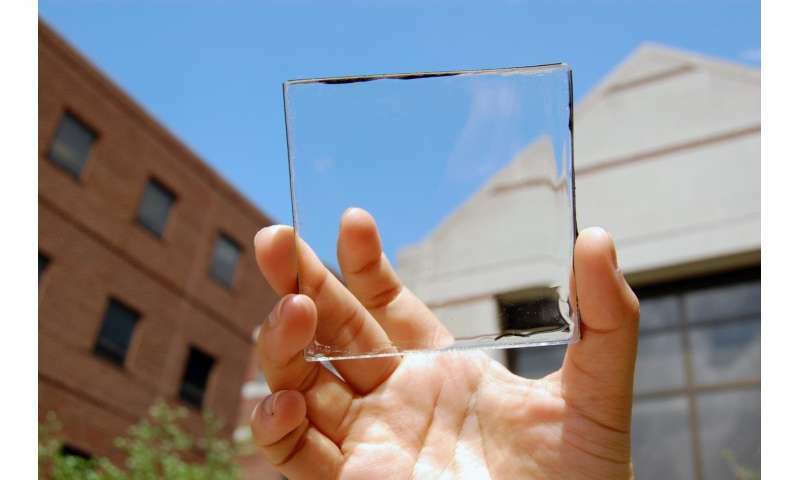 And with that much glass to cover, transparent solar technologies have the potential of supplying some 40 percent of energy demand in the U.S. - about the same potential as rooftop solar units. "The complimentary deployment of both technologies," Lunt said, "could get us close to 100 percent of our demand if we also improve energy storage." "That is what we are working towards," he said. "Traditional solar applications have been actively researched for over five decades, yet we have only been working on these highly transparent solar cells for about five years. Ultimately, this technology offers a promising route to inexpensive, widespread solar adoption on small and large surfaces that were previously inaccessible." The problem with all sorts of convenience solar variants -- from transparent solar to solar "freakin'" roadways -- is that they aren't solving a problem. Land is really cheap, especially in flat, barren places with lots of sun. Now, if someone announced a super-cheap surface material that rejects dust, or a way to make pumped hydro energy storage 10% cheaper per kWh, now you're talking. The diatom stuff was fascinating, because what's better than using a naturally-occurring nanomaterial to enhance sunlight collection? There's plenty of space available in urban areas too. Consider factory/mega store/mall rooftops and parking lots. (Unlike 'reakin' oops, 'freakin' roadways, you mount the cells above the parking.) Yeah there's extra cost for that, but it provides covered parking and the power is generated near the point of use. I think the ultimate answer is all of the above. Large arrays outside urban areas as well as more localized, widly distributed arrays, which would be good to have when natural disaster strike. And yes, the south side of buildings could be a good source of power. Might change architecture to bring back more glass walls and skylights. "Tinted" versions would just harvest some visible light too. All this is really waiting for a Good Battery for grid storage or local storage. Because it was (is?) such a freakin' scam and, sadly, so many bought in to it. It's not a problem --especially with new construction, but even as a retrofit/upgrade, it is a way to install extra capacity at --just as carbon unit says-- the point of use, without having to deal with considerations of appropriate placement. Also, cheapness and ease of installation are huge factors in terms of adoption of new technology, and, in this case, don't require vast amounts of venture capital or public investment to achieve the same scale of result. This is not to say that there wouldn't be any place for grid-scale solar farms. Those, combined with large-scale storage would be the answer in terms of back up supply, if nothing else. without having to deal with considerations of appropriate placement. Then it's not going to be very cost effective. If you just slap these things in every window without care if it's even going to get any sun, what's the point? Depends on what they cost. Ambient light can also produce power. It might make more sense to buy all window units with this glass rather than to mix and match. Land is really cheap, especially in flat, barren places with lots of sun. Come over to populated places (e.g. Europe.) No such thing as cheap land. It's all in use one way or another. I'm secretly hoping for switchable glass surfaces where the glass can darken to capture more of the light spectrum during the times when no one is home. but what the heck is it about the solar roadway thing that flips people out so much? That's still in the testing phase (as it needs to have other properties besides 'generate power'). Looks promising so far. Also a good idea for driveways. You aren't too far off on your comments, but seem to be a half empty guy/gal, (don't want to offend). I agree that roof mounted solar panels on multiple stories that don't have easy roof access, are problemental. Pannels on earth or mars are subject to dust issues, which means they, lke your roofing materials, need to be maintained. I personally have a problem with heights, so I can't take advantage of solar, but on top of that they, the panels will need to be replaced in ten years or less. The article speaks of transparent glass solar pnnels, and homes have a lot of windows, so if the transparency could be adjustable to provide sunshade or privacy, you could have something in that. I was referring to that consideration as regards standard PV panels, E.
Besides which --just what, precisely, is the bug up your backside about? These can be installed in any window, assuming that they receive sunlight for some critical amount of time or some critical intensity on a daily basis. For that matter, what would stop them from being set up in a free-standing configuration? You generally present evidence of being of at least average intelligence and understanding, so why the resistance? You aren't too far off on your comments, but seem to be a half empty guy/gal, (don't want to offend). Roof mounted stuff would be done by professionals, so an individuals aversion to heights would not matter. I'm fine with more opportunistic collection approaches, like exterior walls and windows that harvest energy. They just better add practically no additional cost because there will have to be a lot of area to return enough energy to be worth it. I guess I see traditional collectors coming first, then wider scale harvesting. I like distributed power because it provides robustness in times of disaster. If the solar array survives, it can provide an island of power when the main grid has been knocked down. There are people in PR whose residential installations are doing just that. I'm curious why you consider SFR "promising". I think it is a Great concept, but it seems to be technically and economically infeasible, if not outright absurd. Thunderf00t did a great analysis which seems quite correct to me. https://www.youtu...1KdXgHs4 These things are supposed to be used on roads?? Consider that Tesla has converted the parking lot of a Puerto Rico children's hospital into a temporary solar array. Combined with provided batteries, they have restored power to the facility. Ooops, dropped this bit of comment where Thunderf00t visited a SFR test installation in a pedestrian plaza. They couldn't even stand up to the weather and foot traffic! Buildings are generally rectangular and vertical. Most annual direct solar exposure (other exposures have higher angles and much lower efficiency) occurs primarily on the southern exposure, but even that exposure is always angular, always less efficient than optimally mounted and angled solar panels and consequently has very low light abortion efficiency - regardless of the collector material. In crowed urban environments many perspective buildings will be in the shadow of adjacent buildings much of the day. The end result is a lower efficiency (compared to optimum angle solar panel farms) and more expensive and consequently non-competitive solar technology. The fact that the "window platform" is already in place and a sunk capital cost, has little impact on its long term economics. Current economically viable solar energy applications are highly site and design specific. This means that a large amount of current solar hype - is just that. carbon_unit wrote; "...Consider factory/mega store/mall rooftops and parking lots. (Unlike 'reakin' oops, 'freakin' roadways, you mount the cells above the parking.) Yeah there's extra cost for that, but it provides covered parking and the power is generated near the point of use." If you mix transparent solar with opaque, you'd also decrease the local heat island effect of all that dark asphalt. That's a huge benefit in the height of summer. I just have a theoretical concern with harvesting sunlight once the percentage of insolation for electricity production begins to climb. Whatever work is now done by the sunlight will no longer be done once these panels are installed. Buildings will be colder, requiring more heating. In the summer, that is just fine. In the winter, these panels may incur additional costs. Covering the southwestern desert floor with such panels would have other effects that are unforeseen such as wiping out habitats and changing the biome. We only have one planet that we can play with. As I recall, it only took one errant biologist to wipe out all the chestnut trees in America.